This past year my wife and I were blessed to welcome the birth of our first child. For those who are parents know the thoughts that go through your mind; joy, excitement, nervousness, and worry just to name a few. The last 7 months have been the most amazing and important yet difficult time we’ve ever experienced. Each day we watch our son grow, learn and take on life. He learns a little more and more about himself and us each day and us the same about him. The one thing I’ve noticed as he discovers life and becomes his own little person is his impressionable innocence. Everything he’s exposed to and everything he’s taught is absorbed like a sponge. The same is true for those entering the fire service. New recruits come in as an empty slate who, for the most part don't know anyone or how anything works and will absorb everything they hear, see and read like a sponge. In order to keep the fire service family and brotherhood alive, it is upon us, the current generation to do our best to not allow any negative emotions or feelings towards a fellow firefighter and departmental policies be absorbed by the newer generations coming in. The best thing we could do is to look at the things we don't agree with and turn it into a positive remembering why we signed up for this job. Just like babies, new recruits are excited and have an eagerness to learn, grow and a hunger to prove themselves worthy of this job. So let's embrace the newer generations entering the fire service and show them that although there is downsides to what we do, we can always walk in with a smile on our face, have an eagerness to learn and a willingness to always pay it forward with the hopes of developing the generations to come. I'm sitting in my room, studying with an intensity I didn't know I had. It's the mid 1980's and I am in middle school. My mom and I had just moved from Philadelphia, PA to Augusta, GA for her first military assignment. It might as well be a different world. There aren’t any Philly cheesesteaks and sports teams that I’m used to seeing. Yet, in this very different place, there is one thing I feel connected to; the very thing I am so intently studying: Breakdancing. Middle school is an age where I wanted to fit in and be cool. Being prolific in breakdancing isa ticket to coolness. I carefully read, and reread my beloved practice poster (yes, there is a practice poster for breakdancing). I watch and study MTV like a must-see webinar. And the movies! Oh, I watch every single one the day it is released. Now, I’m not really all that good. Dreamsof being a dancer on a rap video are just dreams. But I can spin around on my head and not get sent to the hospital. I work at honing these skills leading up to the next military assignmentthat my mom and I take to Belgium, then Germany. During my high school years, I find to secure the social life I want, I amgoing to need to learn different dances for different occasions. Sure, breakdancing is a great fit for house parties, but what about the Semi-formal winter dance or the Formal Prom. If I amgoing to get dates and not look like a fool, I am going to need to dabble in the right kind of dancing to move my social life along. Advancing your career with training and education is a lot like learning the right dance. All of the dances are great, but serve a different purpose. • Dances at the house party is down to earth, wild, sometimes crazy or zany. In your career, this equates to training in the fire service. The drills for new people. Improving the skills of tenured people. Working with other stations and units. There is a general way it should be done, but there is room for creativity. • Semi-formal dances have a bit more structure. These are your conferences, conventions, 1-3-day trainings. Going to regional schools. Going to FDIC and FRI. They are home grown classes that may have originated at the fire station, but are now on a bigger stage. • Formal danceshave set expectations for how the event is happening. Dress like this. Move this way. These include official college certifications and formal classes such as Fire Officer I. They take more time and have a set structure. That structure allows for your education to be comparable to others across the world. It helps to measure your investment. It helps to increase your creditability. Just like my dance life, you will do the most good for yourself by attending all the dances. Over reliance on station training may mean not keeping up with best practices. Over reliance on college and other formal training classes will lead to understanding theory, and not practical application. You are advancing your fire service life; your fire service career. Be sure to take part in training and education in all three parts to be ready for the big dances that are coming. And you won’t need to spin on your head, either! Ordinary People Have Extraordinary Impact. NICK BASKERVILLE Nick has had the honor of serving in the United States Air Force for 10 years, followed by 4 years in the United States Air Force Reserves. He attained the rank of Technical Sergeant (E-6). Nick also has 18 years of fire service time, with 15 years of that being in a career department in Northern Virginia. Nick has had the opportunity to hold positions in the Company Officer's section of the Virginia Fire Chief's Association (VFCA), The Virginia Fire Officer's Academy (VFOA) staff, and as one of the IABPFF representatives to the Fire Service Occupational Cancer Alliance. Nick is one of the many trainers for Firefighter Cancer Support Network (FCSN) to offer awareness and prevention training about cancer in the fire service. Nick has the honor of being one of the many contributors for The Firehouse Tribune. Recently, I had a conversation with a good friend of mine who has just been appointed chief of his department. I congratulated him on his promotion and also asked him about his outlook for the role and what he hopes to accomplish. He stated, he would like to bring the department closer together and instill the family values of the fire service back into this department. His one concern however, was dealing with some of the older firefighters already ingrained in their ways and continually use the term, "because that's how we always done it!" Well, for this chief who can relate in age to a few of these firefighters doesn't care about how it was always done. His mentality is "but was it done right?" In his mind, he's looking to not change how the department is operating but IMPROVE how they are operating and looking to do that through team building and acknowledgement of firefighters accomplishments. After hanging up the phone, I left for the gym and started thinking about the talk we just had and thought, this is what it's all about. It's about improving yourself and instilling discipline. Change is all around us and everything is evolving each and every day especially in the fire service. Sometimes when we look at what someone is looking to do, when they are on their mission, we forget that we are all fighting the same fight and all have the same objectives to accomplish yet how it is done vary based on rank or assignment. As humans, in our minds we get turned off that someone is trying to CHANGE what we are doing but are they really trying to change it? Or are they trying to take what is already set up and IMPROVE it? As we've seen for generations upon generations, there will always be generational gaps within people but we can also see that the blueprint that was laid out by older generations isn't being thrown away yet are still very well alive and kicking. This can be seen from the first strategies and tactics books written by Chief Lloyd Layman which isn't many pages to the numerous books today that are hundreds of pages. All of which is built off of a foundation laid out for us decades ago. So as the fire service is evolving, the tactics and decision making skills aren't changing but are evolving and so to the firefighters, we are evolving as well. Here's my advice to you, find things you do each day in your life and as a firefighter that is very routine and find ways to improve them. Not change them but improve them. This can be anything from improving your time in donning your PPE, to improving your time hitting the hydrant so when it's time for the real deal you aren't going through the motions that might've taken you 2 minutes to do but now takes 1 minute or less. This is how things, even the small things, get improved. This is how we can develop a culture of improvement for everyone in the house to do the same and develop a healthy competition amongst members. What Are You Telling People? I say “Good afternoon!How are you doing?” I am stopping to getodds and ends at a supermarket. It is atypical day during the summer here in Maryland;so being inside provides a bit of relief from the heat and humidity. The cashier is who I give this standard greeting. He is tall, lanky, and young. My guess is that this is probably his Summer job. Admittedly, I ask the question about his day out of rote practice. I just heard the conversationbetween the cashier and the person before me. I already know his answer. His response?“Oh, I can't complain.” That’s not the answer he gave the other guy. In speaking with the person just before me, this is the response I hear him say: “Man it’s hot in here. It feels good at first, but then, it’s hot again.” Now, this is a supermarket, not a court of law. I will not prosecute him for telling me one thingand another person something else. And given that he and the other person are wearing the same uniform shirt, it makes sense. He is more comfortable with a known, coworker than anunknown, customer. We all have things that bother us. We are just not up front about telling everyone about them. And that’s fine, until you aren’t fine. There are many people better qualified than I to speak on mental health. What I give you then, is not vast knowledge, but perspective. One that focuses on just on aspect of the problem of mental health in the fire service. Many people wouldn’t know who to tell their problems to if their life depended on it. If you had a problem, who would you tell?Not just any problem, but the kind of problem that would make you question being alive. How much trust you have in another person is proportional with how much would you revel to him or her. Who do you trust enough to tell that kind of problem? I don’t feel like fire service culture makes it easy to talk about weakness, mistakes, and problems people tend to face. In order to have a conversation on that level, there has to be a sense of closeness between 2 people. A sense of trust.Listening to the comments of the young cashier and the guy he was talking to, they are obviously closer to each other than to me. They know each other. They have history. I'm just some dude picking up some odds and ends. No need to trust me with a problem statement. As leaders, I ask we all take a look at what we are doing to make it easy for people to talk about problems. To find the common places and build bridges of trust and safety. Part of leadership is figuring out what that is for each individual. That's a pretty tall order. I've had a fewsuccesses and many more failures throughout my entire career.I don't know that I have a set answer. I will tell you what life has taught me so far. Keep saying “Good morning! How are you doing?” If I go back to that same store on a regular basis and interact that same cashier, eventually, we will get to know each other better. Eventually, we will talk about more things. Eventually, he’ll let me know when the heat is getting to him. Eventually, he’ll trust me enough to tell me what he really feels. Relationships are a lot like planting fruit trees. It takes a while to nurture the progress, but in the end, the fruit that is produced is worth it. As a leader, make trust your everyday order of business. Make trust ordinary, and you will see extraordinary impact. As 2018 comes to an end and we begin a new chapter in 2019, we would like to thank each and every one of our friends and supporters for all of the support and love they’ve shown us this year. It has been a great year as we’ve met with many new people and will continue to work along side them as we continue on our journey. We now embark on a new year. With a new year comes new challenges, new friends and new ways to keep our mission going. To all of those supporting us and following us, keep growing each and every day and continue to serve your community with honor, respect and humility. Remember those who have gone before us not just through words but through action. Challenge yourselves to achieve more and in that will come great success. Lastly, always remember to work hard, stay safe & live inspired. From all of us here at The Firehouse Tribune, have a Happy, Healthy & Safe New Year. As we gather around the table with family and friends this holiday season, let us all remember those who are unable to be home for the holidays. Let us also remember to keep focusing on our goals, to keep training hard and keep staying true to our mission. It’s easy to stray from it all during the holidays but it’s also a time to keep the motivation going as you’re all surrounded by family and friends. From all of us here at The Firehouse Tribune, Nick H, Sean, Nick B, Dave & Nick W, have a very Merry Christmas & Happy Holidays! See you all in 2019. What’s Black, White, Yellow and Red All Over? Honestly, it is a pretty awesome flag. The Maryland state flag. It is a rectangle piece of cloth with the colors black, white, yellow, and red. I am accustomed to seeing flags with different shapes and colors. My time in the military has made travel around the world possible. It’s probably because I have been bombarded with so many flags, I typically don’t give them a lot of thought. Ironically, I didn’t come to realize the greatness of the Maryland flag by living in Maryland. I realized it by working in Virginia.More than a few times someone would ask, "Why do you Marylanders love that flag so much?" Another Maryland native would typically answer, "Because it awesome! "Honestly, he’s not wrong. The Maryland flag is on every possible thing possible. EVERY. THING. Look for a Virginia flag helmet sticker. Can’t find it. A Maryland one? Twenty versions. The flag is on beach towels and coffee cups. It was on a plane from Southwest. A Plane! Although I don't completely identify with loving the Maryland flag, I get it. It's what it symbolizes. When a true Maryland native looks at the flag, he or she can smell the old Bay food seasoning. Taste the blue crabs. The roarof the cheering crowd at the University of Maryland games is deafening. Seeing the flag can take you to a great place for a person from the state of Maryland. Everyone who encounters the Maryland flag can be broken up into three groups: 1) Diehards who value the flag highly, 2) People who don't fully get it, but think it pretty cool and 3) those who simply see it as a piece of cloth with colors. One symbol, three different views. All three views can be debated. As usual, none actually wins. Your interpretation of an object can be as different as the people who see it. So, what's the truth? Unless you live under a rock, you know the US is having some major debates about flags. From the confederate flag to the American flag. There is nothing in this post that will ‘win’ the debate for one side or the other. Yet, in the workplace, in the fire service, or where ever one encounters groups of people will need get work together despite the version truth they see. o A contingent of people from my Virginia Fire Dept went to Ellicott City, MD to help with the flooding situation. I’m not there, but I’m willing to bet no one is judging the Maryland flag. No one is judging ANY flag. People are there to help the mission: get people out of harm’s way.Do you know your organization’s mission? Vision? Values? Successful groups should have individuals with some of these things in common. As a leader, you will need to remind peoplewhat is common among them. Get people to focus on the common mission, vision, and values instead of the different flags. Flags are important symbols for people. They embody a great number of values. Evoke a great number of emotions. All of which can vary from person to person. As a leader, you will be tasked with taking people and uniting them not under one flag, but under one mission. Different people. Ordinary people…who will have an extraordinary impact. NICK BASKERVILLE has had the honor of serving in the United States Air Force for 10 years, followed by 4 years in the United States Air Force Reserves. He attained the rank of Technical Sergeant (E-6). Nick also has 18 years of fire service time, with 15 years of that being in a career department in Northern Virginia. Nick has had the opportunity to hold positions in the Company Officer's section of the Virginia Fire Chief's Association (VFCA), The Virginia Fire Officer's Academy (VFOA) staff, and as one of the IABPFF representatives to the Fire Service Occupational Cancer Alliance. Nick is one of the many trainers for Firefighter Cancer Support Network (FCSN) to offer awareness and prevention training about cancer in the fire service. Nick has the honor of being one of the many contributors for The Firehouse Tribune. It's just another day at work. More things to do than time in the day. I'm at the fire station, making my way up the stairs to fit in what I can. Up the stairs, I make my way down the walk way and take the second left. I open the office door just to drop off my coffee cup. Training is about to happen and I don’t want to be late. I don’t turn on the light, at first. But what is that sound? It reminds me of running water? That doesn’t make sense. There is no water in the office. I turn on the light and oh my, what a sight!One of the ceiling tiles looks more like a cloud instead of a part of the ceiling. It was full of water and beginning to rain down on the entire office. The air condition system is located in the ceiling, just above the office. I have heard stories of how it leaked before. I now have my own story. As a new officer, I'm still working through the gut reaction to be in the thick of the problem. To get directly involved on fixing the problem hands-on. On this day, however, I activate a skill that have cultivated for years.A skill perfect for this situation. That skill?Ignorance.I understand what to do with a busted hose line. I understand what to do for a spill for muriatic acid. I know nothing about what to do for a leaky ceiling. I knew enough to know, however, that there was a problem. Even officers know water is not supposed to come from the ceiling. Sizing up the situation, I knew I need more resources. Downstairsare 2-3 firefighters who would know exactly what to do. I went downstairs and hustled back with a strike team of people to handle with the problem. What did I do? I took two steps back and supported the plumbing strike team while they worked. I handed them a wrench when asked. I held the ladder when needed. I called the maintenance person for the long-term fix. As things are windingdown, the Battalion Chief stopped by. Chief’s seem to either have a 6th sense or hidden camera that tell them when to stop by the station. "Where's the guy in charge? "All fingers point to me in the corner coordinating with the HAVAC vendor on when they can fix the problem. Sometimes being in charge means letting the right people use their skill. Especially when you don't have that skill. I have learned something long ago that I have just managed to put into words. I don't have to be the smartest person in the room in order to lead the room. Let the ordinary people have the extraordinary impact. NICK BASKERVILLE has had the honor of serving in the United States Air Force for 10 years, followed by 4 years in the United States Air Force Reserves. He attained the rank of Technical Sergeant (E-6). Nick also has 16 years of fire service time, with 13 years of that being in a career department in Northern Virginia. Nick has had the opportunity to hold positions in the Company Officer's section of the Virginia Fire Chief's Association (VFCA), The Virginia Fire Officer's Academy (VFOA) staff, and in the International Association of Black Professional Fire Fighters (IABPFF) as a chapter president, a Health and Wellness committee member, and one of the IABPFF representatives to the Fire Service Occupational Cancer Alliance. Functional fitness, strength training and cardiovascular training along with HIIT are essential for athletes of all kinds especially us as firefighters. 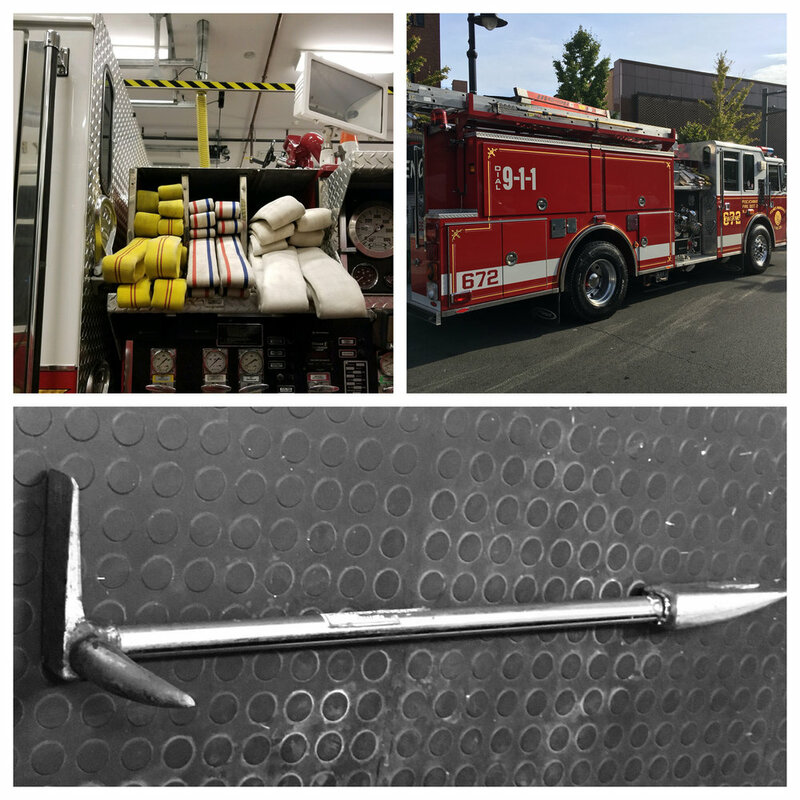 Want to add an inexpensive tool to your fitness regime in the gym, at home, on the go and even in the firehouse? Then get on the Bosu Ball. The Bosu Ball provides a versatile way for functional athletes to get in a full body workout, improve postural stability, as well as static and dynamic balance, thereby reducing the risk of falling. A key aspect to firefighters on the fire ground in many aspects of the job. There’s multiple ways we can use the ball and multiple purposes for the ball. One way to use the ball is to keep the domed side up and utilize it much like a Swiss ball which can help with stability, stretching and performing core workouts. Stretches especially for your calves can be performed by placing the domed side down and stepping on the rim of the platform. A balanced body and a strong core are key areas with respect to functional fitness and us, the functional athlete. Between our PPE, SCBA all while performing hose advancements, searching rooms, forcible entry and overhaul just to name a few, our core strength dictates our performance, progress and capability to work more efficiently on the fire ground and in the firehouse. Don’t be negligent to your body, physically and mentally because in the end you only have one.